What are options and categories? How do I add an option? You can divide your products into different Categories, for example, brands or groups. If you assign categories a menu appears allowing your customers to view only products of a certain category. You can use Options to specify different types of a product, for example, sizes and colors. A menu appears after a customer has selected a product. A product can have multiple options, for example, size L in the color blue. Each unique combination of options forms a variant. For each variant, you can specify an image, weight, SKU, quantity and price. Click Products and open one of the products you have in your shop. Type in the category and click Add. Add more categories or click Done. To add the product to a category, check the box in front. You can add a product to multiple categories. Click Save product when you are done. Tip: To change the order of your categories, click Add/Edit categories and drag the categories in the order that you want. Scroll down to Pricing & Quantity. Check the box for This product has different options. Type in a name for the option, for example, size or color. Type in the Option values, for example, S, M, L if it's a size. Click Add option if you want to add another one, you can define up to 3. 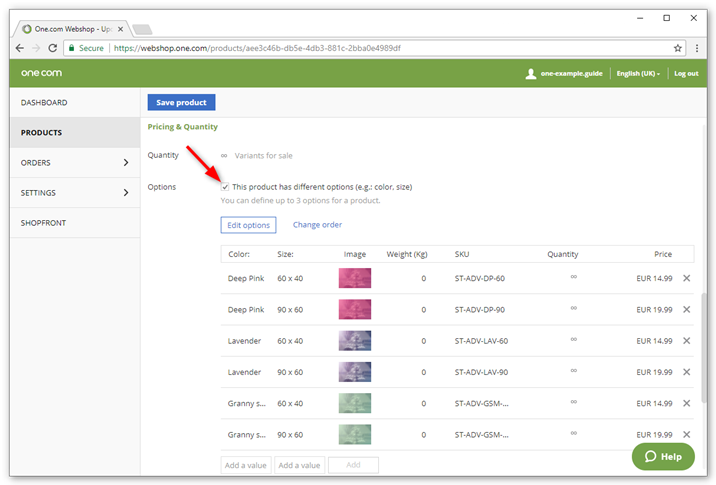 You can now add values for each variant of your product, like image, SKU, quantity and price. You can add more variants in the box below. Click Add to save. You can have max. 200 variants per product. Tip: To change the order of your options and values are displayed in your online shop, click Change order and drag the options and values in the order that you want. Tip: You can add an image for each variant of your product, for example, if your product has different colors. That way your customers can see how it looks before buying.